TORONTO -- An apartment briefly occupied by Ernest Hemingway at the end of his tenure in Toronto went up for sale Tuesday, putting a spotlight on the writer's somewhat rocky relationship with Canada. The American novelist lived in the two-bedroom unit in the midtown building -- which now carries his name -- for about six months between 1923 and 1924 when he was working as a journalist for the Toronto Star, said Kaitlin Wainwright, the director of programming for Heritage Toronto. "He came back to Toronto in 1923 and he almost immediately regretted it," she said, noting that for Hemingway, the city didn't measure up to Paris, where he had been acting as the Star's foreign correspondent. "He really struggled with kind of the Protestantism and the 'Toronto the Good' mentality." 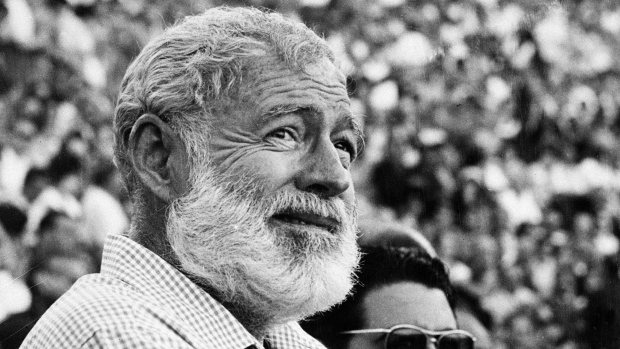 Wainwright said Hemingway saw the city -- to which he first moved in 1920 -- as a "provincial backwater," which perhaps wasn't too far off the mark. In the 1920s, Toronto was not yet the bustling metropolis it would become. "You can kind track through his time not only in Toronto, but in the early 1920s as he's moving around to other cities working for the Star, the evolution of his writing," Wainwright said, noting that when Hemmingway started working for the Toronto paper he was paid less than a penny per word, leading to a more verbose writing style. "Obviously Hemingway the novelist is really known for a very minimalist use of language, a very sparse use of language," she said. "But when you go back and read some of his earlier works, it's like, what? This is not the Hemingway that we knew." "The number of luminaries in Toronto arts and culture who lived there in the middle part of the 20th century is really striking to me," she said, listing literary critic Northrop Frye and musician Glenn Gould as residents. "You get a nice feeling when you walk into the place," he said. "An eerie sense of history." Harrild said it's long been known that Hemingway lived in the building, but it wasn't until about five years ago that scholars discovered he had rented out Unit 19 specifically. An American found his year-long lease -- signed in October 1923 and broken early so he could leave the city -- that specified his unit and his rent: $85 per month.